In February I posted the that sell-off in January was overdone and that it was very likely that the bottom for the major equity indices had been achieved for 2016. At the time, the bear case included a number of fundamental factors: a hard landing in China, the strong U.S. dollar and domestic manufacturing weakness, falling energy prices, the current earnings recession for U.S. corporations, and prospective Fed rate hikes. Pundit recession predictions had become the norm, corporate spreads were at post-crisis highs, volatility was elevated, and equity indices across the globe were falling. Indeed, the market was, at the very least, ripe for an over-sold bounce. The call was predicated on sentiment indicators which had turned decisively bearish, and the thesis that the energy swoon did not pose systemic risks to the U.S. banking sector and recession was not imminent. Since February 11th, the S&P 500 has rallied an impressive 12.4% and the excessive bearishness that was prevalent in February has swung to complacent optimism (as evidenced by put-call ratios, and other sentiment indicators). Investors might want to exercise some prudence and tactically adjust their equity exposure downward. The market will be fighting a number of short-term headwinds: seasonal weakness, projected earnings declines, higher margin, and of course, the U.S. presidential race. I am not forecasting a recession over the next twelve months, or the twenty percent decline that often accompany such a slowdown. And I still believe that the lows for 2016 have been achieved, however, exercising caution and using the robust run-up over the past two months to pare back equity exposure is a sensible approach. Any tactical adjustment lower, should of course, be reversed if equity markets breakout to new all-time highs. For investors with a longer time-horizon and the ability to stomach another run-of-the-mill correction, now is not the time to strategically adjust equity exposure lower. Despite the weak GDP growth in the first quarter (Atlanta Fed estimates .1%), many of the economic headwinds of 2015 are subsiding. 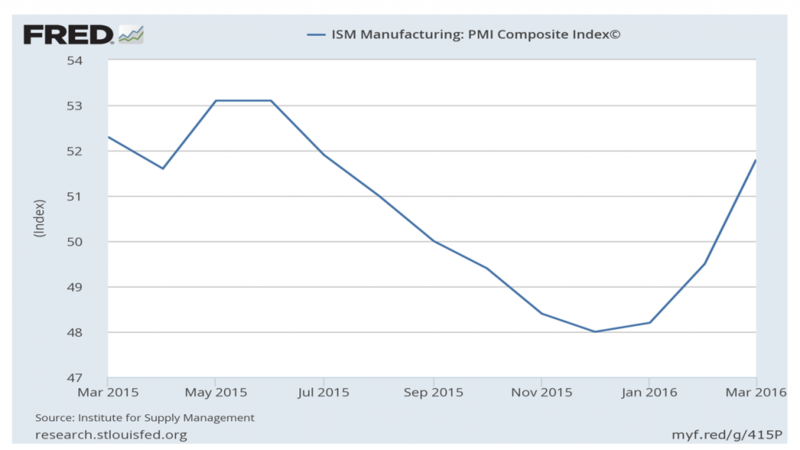 Manufacturing Indices have rebounded over the last month and are actually signaling expansion. 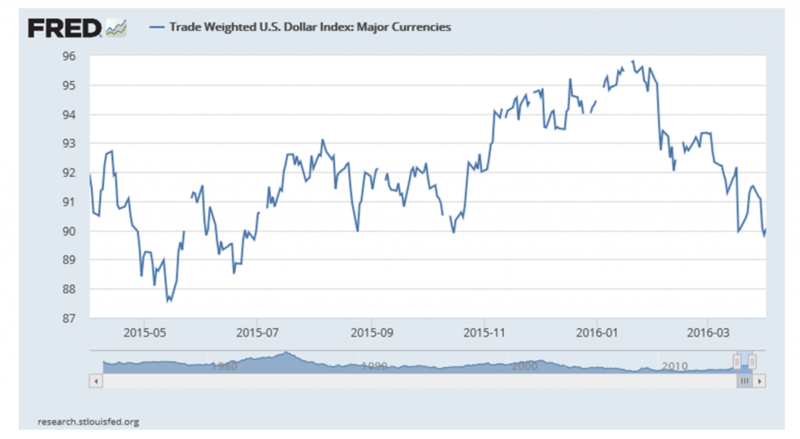 The dollar has weakened considerably. Many of the energy related write-downs (which has affected GAAP earnings) are behind us. And finally, commodity markets are rebounding. Despite all of the rhetoric around the Federal Reserve and detriment that accompanies rising rates, monetary policy remains accommodative. More importantly, one of the most accurate leading indicators for the market and the economy, the yield curve, remains intact. Historically, an inverted yield curve has forecasted every major recession over the last century. And, as illustrated below, the shape of the yield curve has important ramifications for stock market performance. The blue shading represents the steepness of the yield curve as measured by the difference between the two and ten-year treasury yield (LHS). The S&P 500 is the red line (RHS). 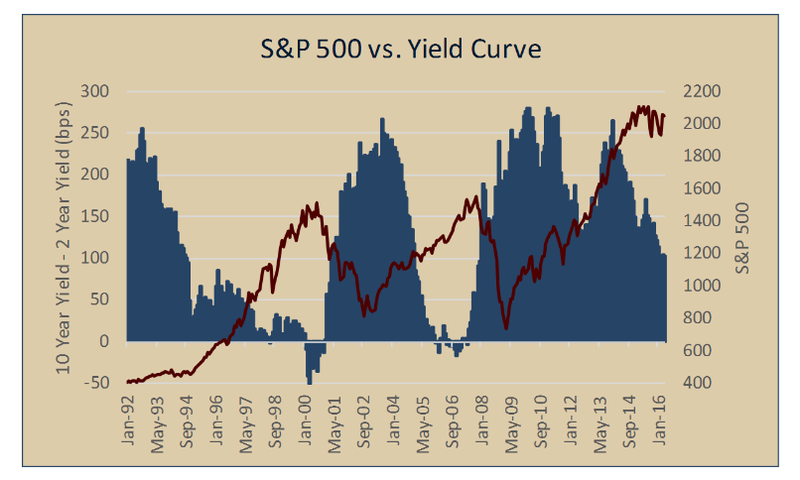 Generally, market tops occur when the yield curve is flat or inverted. Market bottoms occur when the yield curve is extremely steep (at least 200bps). This speaks to the reactionary nature of the Federal Reserve, as they adopt policy to current economic conditions. Fed projections are inherently optimistic at tops, and as economic conditions deteriorate, they lower short-term rates quickly resulting in a steepening yield curve (or what bond investors call a bull-steepener). Typically, this bull-steepening trade coincides with weak economic growth and equity market drawdowns. At the bottom of markets, growth projections are often at their lowest. As the economy improves, the Federal Reserve reacts by raising short-term rates to prevent the economy from overheating. The curve begins to flatten out as short-term rates converge with longer-term rates. This bear-flattening trade coincides with economic strength and robust stock markets. Currently, the 2-10 spread is around 100 bps. If it continues to flatten at the same rate, we can expect an inverted yield curve by Summer 2018. In any case, monetary conditions at this point, are not signaling recession. If there is a hitch in the bear thesis, it is their trouble with the curve. There is an abundance of explanations as to why the yield curve is no longer a valid economic predictor, and why “this time is different.” They range from the failure of the Japanese yield curve, to Fed manipulation. In a former article, I differentiated between the Japanese and U.S. economies and why I believe the U.S. will not go the way of Japan. Regardless, there is zero evidence in the U.S. that the yield curve has lost its predictive value. Fed indecision regarding the pace and the implementation of rate hikes has brought with it considerable volatility on the front-end of the yield curve. Over the past year, the economic data has been mixed, and as a result, the signals from the Fed have been inconsistent. Strong employment data drives front-end yields higher, only to be met with fresh treasury buying in response to weak global markets, declining U.S. manufacturing and the headwinds of a stronger dollar. The shark tooth chart below illustrates the whipsaw nature of the two-year treasury, and the likely bites that it has taken out of speculators’ trading accounts. As you can see, the current bull market (green) has been incredibly sensitive to the Fed’s actions. 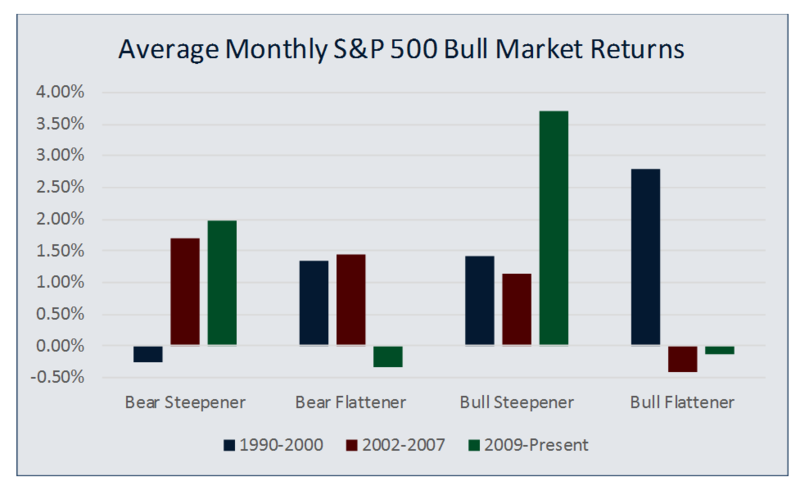 The two curve types that the Fed controls the most are bear flatteners and bull steepeners. The stock market has responded incredibly well to a bull-steepener trade, averaging monthly gains of 3.5%. Meanwhile, the market is negative during a bear-flattener. When the Fed indicates that it will tighten monetary policy, the market flounders, and when economic data enables the Fed to back off of their tightening trajectory, the market rallies. This comes as little surprise to many since the “bad news is good news” slogan has been the mantra of this bull market. Those who have read my prior posts know that I believe rate normalization is healthy policy. Given the current status of the labor market, and core inflation, which is headed higher, the Federal Reserve should be raising rates. The market, however, is at odds with Fed consensus. Currently, the Federal Reserve is projecting six rate hikes by the end of 2017. The market is pricing in two. Moreover, ten-year treasury term-premiums are currently negative, and the lowest they have been on record. 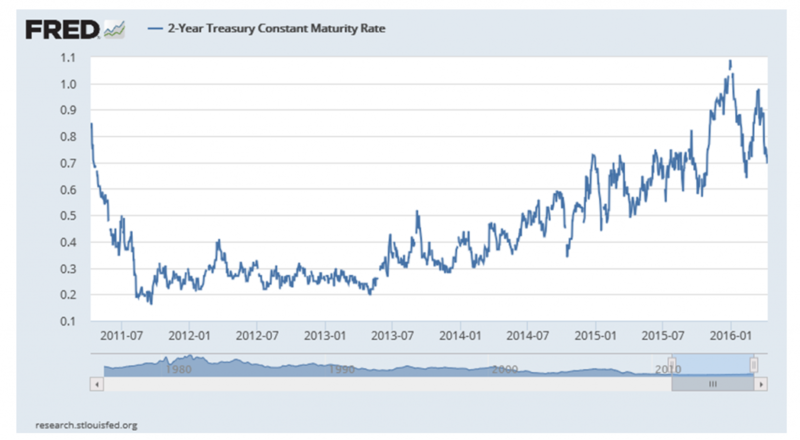 This means that not only does the market and the Fed disagree about the path of short-term rates, but that investors are not demanding any premium for the duration and volatility risk of owning a ten-year treasury. If the Federal Reserve continues to raise rates, at their projected pace, the yield curve will likely behave in one of two ways: a bear flattener, or a bear steepener. The bear flattener trade has been a headwind for equity markets, since it reflects investor disillusionment with Fed policy, and as such, there is more uncertainty surrounding the economy and stock prices. A bear steepener trade is much more accommodating for equity prices, since investors view economic data as strong enough to merit rate increases. My outlook for 2016 includes both of these environments. A rate hike in June is likely to be met with market condemnation and a bid to the long-end of the curve. The resulting flattening will likely provide a difficult environment for stock prices. As labor market data and inflation data continue to improve, further rate increases will be met with less skepticism and a steepening yield curve. The pervasive bearishness and oversold conditions in February are now gone. As a result, those investors who take a short-term tactical approach to their portfolios should pare their equity exposure. Long-term strategic allocations to equities should remain neutral since recessionary fears are still overblown, and monetary policy is still accommodative. Investors can expect volatility as the market continues to be disillusioned with Fed rate normalization, however, this discrepancy will wane towards the back-half of the year. Pay close attention to the yield curve, the flatter we get, the higher the probability of a major market top.